Performance Time: Approximately 60 minutes, 42 pgs. FARCE. 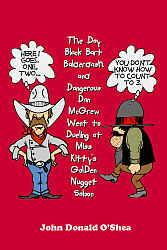 When Black Bart accuses Dangerous Dan of cheating at cards, the two decide to duel it out at Miss Kitty’s Golden Nugget Saloon. It seems like a simple way to solve a dispute, but navigating the town’s bureaucratic red tape makes shooting it out more difficult and confusing than either had anticipated. Not only is Dan unable to count to three, but the townspeople inform the duo that they must apply for a dueling license and purchase a coffin, a will, feed for the hearse horse, and a suit to be buried in before the duel can commence. Dan and Bart, both short on cash, set out to steal the funds needed for the duel only to find out they have to purchase a larceny license first! Hilarious situations and characters abound in this fast-paced farce.